I want to know if the bank site below is real. I would appreciate it if you could tell me if it is true. I am curious about is that there is money on the bank site. You can check the amount by remitting to the same bank. If you remit money, it will be displayed on the bank site. That's because we didn't pay a full 10% commission. My question is, is this email from the international remittance department correct? Once again, I would appreciate it if you could check the accuracy of the bank site and email. I think it's fake because of the 10 percent commission. My girlfriend is saying that it is a bank site that she used for a long time. I want to know the exact information. 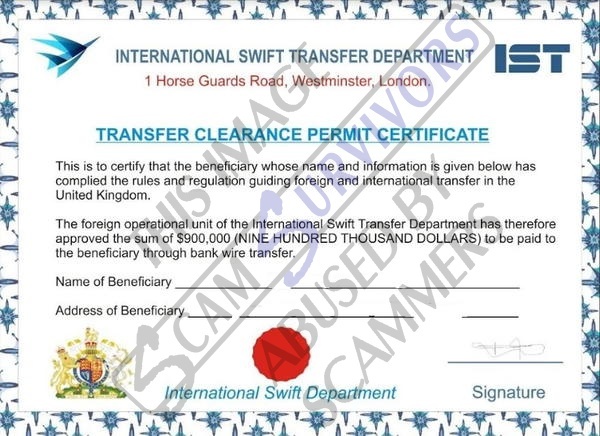 forwarded to the International Swift Department. The transfer process has been successfully initiated. Address: 1 Horse Guards Road, Westminster. 3hours to your local bank account. initiating an international money transfer. sender and delete the material from any computer. attachments for the presence of viruses. No, the bank you are asking about is not real. Your "girlfriend" sending you to that bank is also not real. "She" cannot "for a long time" use a bank that was created only few months ago. The bank and the girlfriend are, in fact, the same person playing both characters and behind this entire story, is a fraudster located somewhere in West Africa. The fraudster in contact with the victim is the same one operating the fake bank. The fraudster knows the amount sent by the victim from the correspondence he have with that victim and it is easy for him to create a bogus bank account on a fake bank website, updating that account with the payments that victim made. After being targeted in a romance scam by a scammer, usually pretending to be abroad (military or business person), the victim is asked for help in recovering money from a bank account the scammer claims to have opened on the fake bank website. The victim receives the login details allowing him / her to check that bogus bank account of the scammer. To help the scammer transfer the money, the victim is asked to open a bank account on the same fictitious bank website. The victim will be asked to pay an activation fee and only after that stage the fraudsters will provide the login details for the victim bank account, showing the payment is done. There will be other payments requested for that transfer and all those payments will reflect in the bank account created by the fraudster on the fake bank. The transfer will never happen. The bank is fake. All the bank accounts shown on the fake bank website are not real. The victim will be paying fees upon fees until he / she is penniless. Additionally, the victim details, stored insecurely on the fake website, would be available for anybody knowing how to look into that fake site and that victim will be targeted in more fraud, phishing and malware attempts. The scammers are always asking for copies of their victims identity documents. Those copies can be used to open bank accounts for receiving stolen money, or create fictitious companies opening bank accounts in the same way. Some fraudsters even apply for credit using copies of their victims identity documents. When other victims complain, the investigations would lead back to the original victim who may end up in jail, while the scammer will be free to repeat the fraud with somebody else. The site pretending to be International Swift Department shows no content. The domain is used only for the email address. The location used in the email received, 1 Horse Guards Road, Westminster, belongs to Home of HM Treasury since 1940. For the fake site details: https://db.aa419.org/fakebanksview.php?key=136066. The real HSBC Bank was founded in 1865. The fake one was created in September 2018. HBSC Bank is one of the first of global virtual banking services, which, in fact, was created as a mobile application from an organization that is not a bank, but promotes its services as banking, relying on legal and processing support Partner bank. For the fake site details: https://db.aa419.org/fakebanksview.php?key=136067. The same location is also used with another bank, bankrconline.com. The same phone number is also used with fastexpresslogistics.com, trans-globaldelivery.com, and expressdhl.net. Bank Royal Commercial, established in 1993, is a full-service commercial bank that caters to the retail and commercial needs of individuals, small and medium sized companies, and major corporations. Merit Federal Credit Union has a robust branch network comprising of 106 locations with its headquarters in the central business district of UK. The Bank offers a full suite of banking products and services that include business banking, personal banking, treasury services, and commercial lending. Bank Royal Commercial operates wholly owned subsidiaries. For the fake site details: https://db.aa419.org/fakebanksview.php?key=136068. Same phone number was also used with sun-trust.online, no longer active (suspended). The fake site claims to be a delivery company named Fast Express Logistics Shipping. Fast Express Logistics Shipping L.L.C.,Cargo Services In U.K , was conceptualized and established in 1997. Fast Express Logistics Shipping Cargo Services In U.K is a privately held and independent shipping company offering total Cargo logistics solutions to individuals and companies. Fast Express Logistics shipping cargo services in U.K represent UK within the ISO 9001: 2003 Certified Universal Freight Organization and have exclusive access to partner offices in 116 COUNTRIES. 81 Colorado Way, RHIWARGOR, U.K.
For the fake site details: https://db.aa419.org/fakebanksview.php?key=136069. The fake site claims to be another delivery company named Trans Global Delivery Shipping. Trans Global Delivery Shipping Cargo Services In U.K is a privately held and independent shipping company offering total Cargo logistics solutions to individuals and companies. Trans Global Delivery Shipping L.L.C.,Cargo Services In U.K , was conceptualized and established in 1997. Trans Global Delivery shipping cargo services in U.K represent UK within the ISO 9001: 2003 Certified Universal Freight Organization and have exclusive access to partner offices in 116 COUNTRIES. For the fake site details: https://db.aa419.org/fakebanksview.php?key=136070. Express DHL Shipping Cargo Services In USA is a privately held and independent shipping company offering total Cargo logistics solutions to individuals and companies. Express DHL Shipping L.L.C.,Cargo Services In USA , was conceptualized and established in 1997. Express DHL shipping cargo services in USA represent usa within the ISO 9001: 2003 Certified Universal Freight Organization and have exclusive access to partner offices in 116 COUNTRIES. 81 Colorado Way, RHIWARGOR, USA. For the fake site detials: https://db.aa419.org/fakebanksview.php?key=136071.